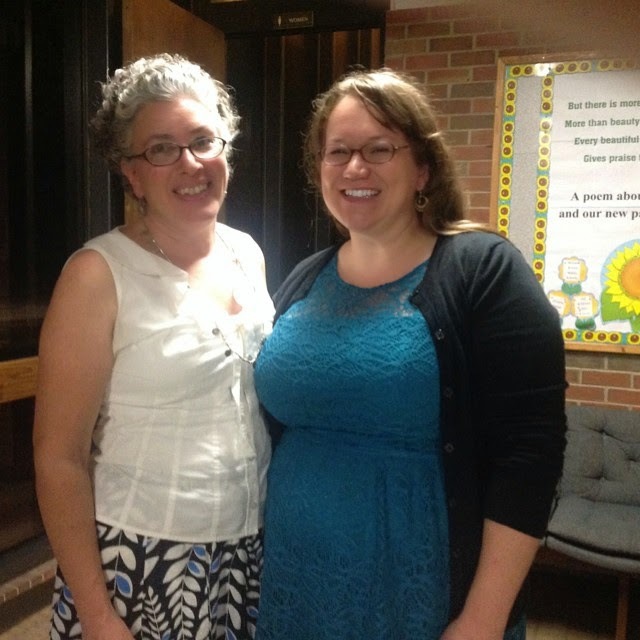 : How can we build a Catholic culture in our parishes? Well, I just so happen to have some ideas. How can we build a Catholic culture in our parishes? Well, I just so happen to have some ideas. It's probably already pretty clear but I'm a Catholic geek. Not in theologian-geeky way. Not in the way where I write really awesomely insightful commentaries on pop culture and legit culture. I'm a Catholic geek in that I sit around and daydream about ways that we can build up our parishes. I think about how I can possibly tell people about events happening at our parish so they'll want to come. I create wishlists of people who I want to be more engaged and using their fabulous personalities and talents to build up the Church. So I have all these ideas and I don't know what to do with them, or even if they're good ideas. But I'll tell you this: Besides the Sacraments, what I want more than anything from parishes is for them to actively be building a Catholic culture. I want all parishioners to stop being culturally Catholic and start living out their faith vibrantly. I'm so bored with local parishes doing the same things that the local protestant churches and secular culture are doing. I want to see Catholic parishes sponsoring activities that are unapologetically Catholic. I want to see parishes helping families to create Catholic cultures in their homes. I want to see those families' cultures to then feed back to the culture of the parish. And I want to see the Catholic culture that is thriving in the parish and the home spread into communities so that everyone knows that there is something special happening at the local Catholic Church, beyond transubstantiation. - An All Saints' Halloween party that has all the creepy quirkiness of Halloween and Catholicism instead of another Trunk-or-Treat. - Egg hunts, special coffee-and-donut socials, and maybe even fun coloring page inserts in the bulletin during the fifty days of Easter instead of the Easter Bunny showing up at an egg hunt during Lent. - Parish cookbooks that have a whole section dedicated to meatless meals and education on the fact that if you're not practicing meatless Fridays you need to be doing another kind of penance every Friday of the year. - But then of course we'd need special bulletin announcements celebrating Meat Fridays! - Then, instead of having Santa Claus come to a Christmas party during Advent, St. Nicholas would visit the coffee-and-donut social just before his feast day. - And instead of the Catholic parish hosting a generically Christian VBS, the same one as all the other churches in town, they would sponsor an authentically Catholic, engaging, and fun Totus Tuus youth program during the summer. - Imagine if all the existing ministries would support, promote, encourage, and work with one another, plugging people into ministries that fit their personalities, stages in life, talents, and needs. Also, this kind of collaboration could and should lead to co-sponsoring larger events like bringing in top-notch, national speakers or musicians or parish-wide picnics with bouncy houses and catered meat. - Events that are family friendly because children are either welcome / encouraged to attend, or free babysitting is provided are held on a regular basis. - And imagine a playground that is close to the church so kids can run out and play after Mass while their parents visit. A couple of benches would be even better so parents can sit and watch kids play while their friends / spouses go to confession or split a holy hour. These are the kinds of things I daydream about. These are the ideas that I geek out about. An entire parish, authentically living out the Catholic faith in a way that is joyful, beautiful, and fun. Of course with this list I am also hoping that as the Catholic culture grows so will a deep love and reverence for the Eucharist; a strong appreciation for holy orders, religious life, and the sacrament of matrimony; and a true sense of gratefulness for reconciliation. I don't know if my ideas are the best way to make happen my end goal, my ultimate dream of a thriving, Christ-centered, joyful, truly Catholic parish, but they're where I'm starting. There's nothing wrong with brainstorming, right? PS. I'm at Blessed Is She today talking about the children of Fatima, the converts of Athens and you! I love this! I'm starting a ministry at my parish and geeking out at all the other things that could be done too. Luckily, it seems like a lot of other people are thinking the same way, there have been a ton of new things started at my parish lately, I love it! It's great to feel that the holy spirit is getting our parish to fire on all cylinders, so to speak :). Oh, why isn't there a playground just outside so we can all hang out afterward? Love your ideas! Oh my goodness, I LOVE this! We actually have a pretty great and vibrant parish community, but I think I want to steal a bunch of these anyway!! See that is the parish I grew up in. Of course we had a Catholic School and the Sisters of St. Joseph did all the directing but I miss the fellowship we had in that parish. A playground! What a difference a FENCED IN playground would make! How am I supposed to socialize with other adults in the social hall if my kids are constantly in danger of the mountain of folding chairs falling on them/wandering down the hall because there are no doors/climbing the steps into the office area/etc, etc, etc. All parishes need a playground! Yes, a fence would be nice, too, wouldn't it? Contain ALL THE KIDS!!!! I love all your geeky ideas. Our parish recently changed the Mass schedule to one where we have one mass really early, one really late. It's kind of a pain that there's no super-conveniently-timed one. BUT, the reason they did it was to sandwich religious ed in between the two masses AND focus on adult religious ed during that time too. They have a "cafe" open all morning and bring in speakers for that time in between the two masses. I think it's a great idea. Julie, that is AMAZING!!! Have people been attending, or have they just been grumpy about the change? It sounds really fabulous! These are awesome ideas! I was a Totus Tuus teacher in my diocese in college, and I can say from first-hand experience how much of a complete blessing it was to every parish we went to - no matter how involved or vibrant they were before. Also, playground! What a great idea!! I was standing with a friend after Mass on Sunday watching our kids play in the grassy area beside church. I remarked to her that we needed a playground and a place to sit. So I like how you think! What's a meat Friday? Also: we totally used to have an awesome platlyground at our church when we were little and it was perfect- all the families would stick around for at least an hour socializing after each mass! 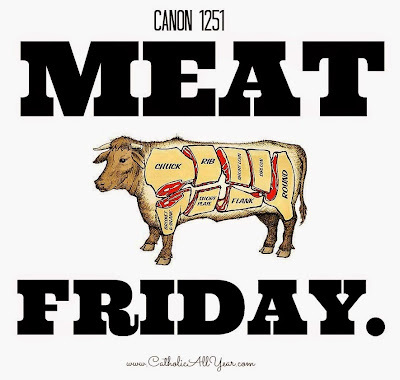 Hey Giedre, I'm not Bonnie but since I internet-know-you... Meat Fridays are Fridays that also happen to be major feasts or solemnities -- so for those of us who don't eat meat on Fridays year-round as a penance, these are days we get to eat meat on Friday! Thanks for jumping in, Brigid! And I'm going to use this opportunity to step onto a soapbox and say, "I think it would be a VERY GOOD THING if the US Bishops had us all go back to fasting from meat year round. 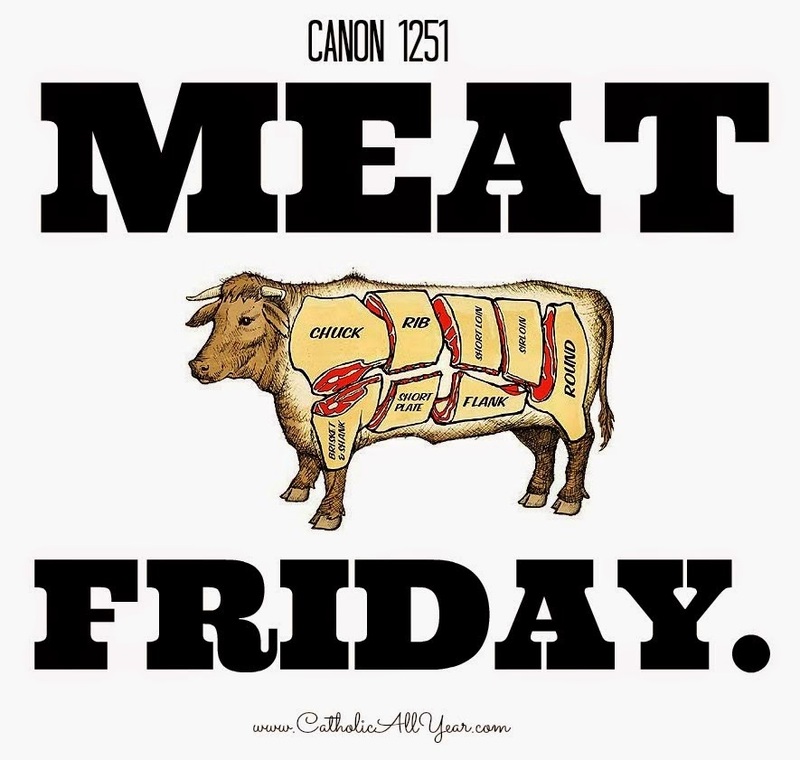 Sadly, most Catholics (myself included just a few years ago) don't know they are supposed to do some kind of penance if they're eating meat on Fridays. PLUS, no meat Fridays helped build and carry a Catholic culture, which is a good thing, methinks. And then, when a Meat Friday comes it's a lot more fun." I should have thrown one more "amazing" into that, just to look like a complete lunatic. WOW! You really are fortunate. And confession every day! This Lutheran pastor's wife would *TOTALLY* join that parish! I seriously want to take all these ideas to our next parish council meeting....a playground with benches at the church? That would be amazing!! I wish I could figure out a way to implement things like this! We're having a homeschooling families get together in a while and maybe I can bring some of it up... But our parish has a school attached, and I feel like all the families with kids in the school know each other and I have no way of getting "in" with them because our kids don't! There really do need to be more family-centered activities available! Rosie, I bet that the parochial school moms and public school moms feel the same way about the homeschooling group. Approach your pastor and / or secretaries and see what they know. Maybe reach out to the administration at the school and see what they know. I'm sure there are ways you can all connect with one another and make things happen! 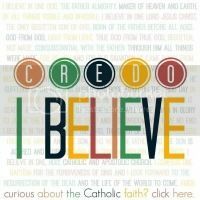 That Credo button is totally adorable! And I really wish I lived close enough to attend church at your parish. There is such a disconnect between the church, the community, and what people need. I like hearing about your lofty ideas...do keep sharing! I agree! "I want to see parishes helping families to create Catholic cultures in their homes" And while you are finding ways to encourage this in parishes, here is a new(ish) website aimed at helping families do exactly that! Hi Bonnie. This is a great post, I love all of your ideas, so great! I too having been mulling this over for my own parish as well. One of the biggest influences for me right now has been the book "Forming Intentional Disciples" by Sherry Weddell and it's companion book "Forming a Parish of Intentional Disciples". These books emphasize exactly what you are talking about, getting out of being culturally Catholic and creating dynamic Catholic homes that in turn feed into parish life. The language she uses is "intentional disciples", but it is the same concept. Happy nerdy-Catholic dreaming from a fellow dreamer. You are my kind of geek! I want this so bad in my small-town parish. There is not a lot of Catholic culture going on here.... New best friends high five!